A quick power cycle currently breaks my circuit. I am attempting to delay the initial triggering on startup of this comparator circuit. I have a timing cap that holds charge and is discharged down to ~0.4V when the circuit is turned off (Then slowly bleeds to 0V). A bleeder resistor in parallel with the cap either wouldn't discharge the cap fast enough to work or would be too low of resistance and ruin the timing circuit. Is there any way to either slow the triggering of comparator, increase the initial value on the negative rail, or decrease the value on the positive rail to 0 on turn off? Please sign in or create an account to comment. No answers yet. Contribute your answer below! You must log in or create an account (free!) to answer a question. Anyone can ask a question. Did you already search (see above) to see if a similar question has already been answered? If you can't find the answer, you may ask a question. 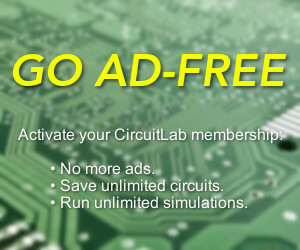 CircuitLab's Q&A site is a FREE questions and answers forum for electronics and electrical engineering students, hobbyists, and professionals. We encourage you to use our built-in schematic & simulation software to add more detail to your questions and answers. Please respect that there are both seasoned experts and total newbies here: please be nice, be constructive, and be specific! "Boombox failure on battery power"
"Design Project 2 Filters Circuit"